I was watching a show on TV last week about the Middle East, and I noticed this flag from Jordan (I believe it was an insurrectionist force from the 70's): It was red, and in the center it had a yellow circle with a symbol in it. I'm assuming this force was USSR-backed. 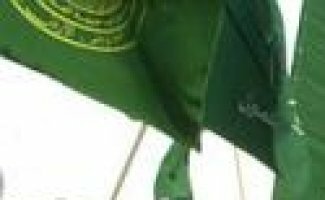 A flag in a Yahoo anti-war photo slideshow is identified as that of the Moslem Brotherhood Movement. 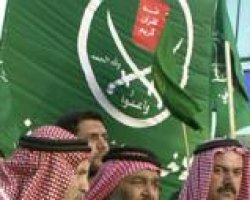 I suppose that they meant the larger banner with the symbol with the white crossed swords and writing and the red panel (a representation of the Quran?) within a white ring, but they might have meant the other flag, only partially visible, with what looks like a yellow seal on green. The larger banner has some writing that is probably clear enough to read, but neither is clear enough to draw. This shape, as seen in the cropping I posted, includes an outer and an inner line, like a seal would. Further elements seemed to be only writing. I don't think there is any other graphical element in the flag. [I have a] black and white piture of Israeli troops on the Temple Mount after capturing it in the Six-Day War (1967). One soldier is holding an Israeli flag, of course, but also being held are a number of captured Jordanian flags. The Jordanian flag in the back, and two Jordanian Army flags, one upside-down (the fly device seems lower than usual on the one flag where I can see it, the upside-down one; I can't see the fly of the other). However, there's another flag I don't recognize: three horizontal stripes, light on top and bottom (green?) and dark (red?) in the center. Crossed swords and crown as on Army flag (crown within sword tops) with surrounding wreath, all in yet lighter color (gold?) in center; Arabic writing still lighter (white?) on either side of that symbol on the center, dark stripe, one word on each side. Only guessing at it, here: "Wa-allah wa-lashamah"? Yahoo News has a confusing scene of an anti-war demonstration in Jordan, with some flags. Is that a Che flag in the background? And what is the red flag in the foreground? The red flag in the foreground looks like having a red and white element, possibly a wide arrow or, considering this is Jordan, a seven-pointed star. There also appears to be some white Arabic writing along the top of the flag.